Recently in Los Angeles Times I came across the article on Ukuleles and I remember Unk Dicko, the ukuleles man back home. In June 2009 he participated in the Active Ageing Exhihibition playing his favourite ukuleles with two others here. This little musical instrument has made a come back in US for the last few years and is gaining popularity now. 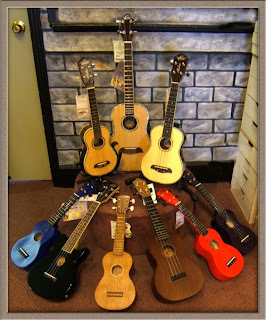 Demand for hand made ukuleles has exceeded supply and the waiting lists stretching out more than a year. Each costs between a few hundred dollars to US$3,000. The cheap ones mass produced from China costs about US$30 each. A former Beatle George Harrison was well known in the uke circles before his death in 2001. The article stated that his bandmate Paul McCartney reignited the public's fascination by playing the instrument in the 2002 tribute Concert for George and in other performances. Will ukuleles strike a chord in Singapore too? This is a good opportunity for Unk Dicko to take the lead to form an Ukuleles Circle. Hi Philip..thanks for the suggestion of a UKULELE CIRCLE. Although there are some small groups here and there who meet up to basically jam uke music, they are not permanent. I will consider it in due time. Glad you have observed the upbeat trend in ukulele playing. In Singapore, schools are starting to introduce ukulele to their kids rather than the old-fashioned recorder. From the uke, it is easier to progress to the guitar. I strongly encourage anyone young or old to take this up. As you mentioned, the ukes made in Asia are good and cheap($ 30-45 our money), good enough. My recent performance in June..I deliberately used a MAHALO soprano uke costing only $30. I told the crowd about this to encourage them and their kids. Although I brought along my handmade KAMAKA ( more than 1K Sing $ ) I did not use it. This first visit brings back memories. I am glad to have stumbled on this blog today. There is a UK punk band called The King Blues. Their lead singer plays the ukulele in most of their numbers, particularly in their 'Punk and Poetry' album. The uke transcends all ages and genres.